On September 18th & 19th over 30 artists participated in creating our 25th anniversary mural on the corner of Eastern Parkway and Franklin Avenue. A huge thanks to the artists who gave their creativity and their time. We would like to thank Council Member Letitia James and DYCD for funding, Eli Mazon for permission to use the wall, 77th Precinct for assistance, and Susan Boyle for co-ordinating the project. A huge thanks to the artists who gave their creativity and their time. and a wonderful slideshow by Alessandro Vecchi. The 25th anniversary of the mural project takes place in the fall. We are looking for individual artists and children groups to propose artwork for a panel painting, which will be done the weekend of September 18th to the 19th. We are excited to bring more art to the Crow Hill community! Your ideas are welcomed. Submit your proposal to the panel by filling out the commitment form. We honored our 25th anniversary with these three great projects. Four students: Floyya Richardson, Quanaisha Phillips, Ansie Montilus, Monica Parfait and Treverlyn Dehaarte from Paul Robeson High School worked with Alex Kelly, a new resident in Crown Heights, to learn more about the history of our changing community. They recorded over 60 conversations with people who have lived in Crown Heights, Brooklyn for over 15 years. The interviews were presented to the community for a listening event in Spring 2010 to celebrate the 25th Anniversary of Crow Hill Community Association. Inspiring and beautiful B&W portraits of the participants by local photographer Cheney Orr were also part of the documentation. 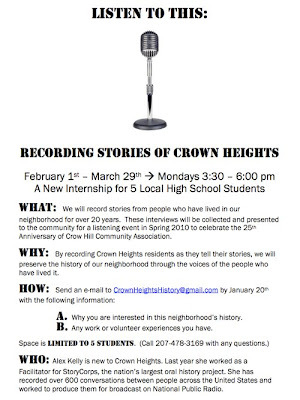 By recording Crown Heights residents as they tell their stories, they preserved the history of our neighborhood through the voices of the people who have lived it. Learn more on the project blog, Listen To This: Crown Heights Oral History Project, or read more about it on Brooklyn Historical Society Blog, Nostrand Park, and I love Franklin Avenue.